The goings on chez the Steviemanse. The indignities suffered by Stevie. The blight on humanity that is the Long Island Rail Road, with special reference to that part of humanity named "Stevie". Spelling will vary throughout between standard English, American English, and the personal Stevie dialect of Manglish. Live with it. Day three dawned and I decided we would take a trip to Rycroft for to do some photographie. 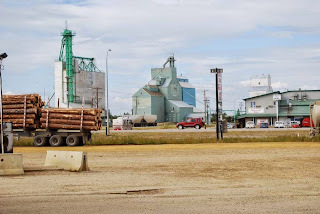 I've been making this trip whenever I can when we are in Alberta, and I have pictures going back to when Rycroft had working wooden grain elevators 1 . Sadly, these have fallen into disrepair and of the two large ones left, only one is used now. All the grain traffic tends to end up at the humongous concrete affair on the other side of the main road. Rycroft will one day be realized in an N scale layout when I get round to building it. It is an ideal model railway town, being essentially a crossroads in the middle of the prairie which has a gas station and a diner patronized by the people on the way to or from Dunvegan or the truckers going to or from the oilfields in the north. There's even a big mural of the yellow suspension bridge at Dunvegan in case you need another reason to go there, painted on the back wall of the diner. I've seen some truly bizarre vehicles parked in that football field-sized pull-off too. A giant shed on caterpillar tracks that looked like a mobile barraks for a small army mated to some Nazi wet-dream SuperPanzer, huge skeletal structures of fantastical shapes and unguessable uses lashed to low-loaders, that sort of thing. Dead interesting2. There is also a giant Tepee that has been a visitor information center and a T-shirt and souvenir shop but now stands empty, slowly falling to pieces. It has a steel frame and a cloth covering and the wonder is it has lasted so long. And it is ginormous, about as tall as a two story house and a good thirty feet or more in diameter. It was in this very structure some twenty years ago that Bil the Elder first elucidated his "They're All Trying To Cheat Me" theory concerning the Province-wide standard $25 cost of a sweat shirt. A controversial idea that flew in the face of the conventional view that "That's What A Sweat Shirt Costs In Alberta , And Anyway It's Canadian Dollars For Wolfe's Sake!" but one to which he remains firmly committed to this day, perhaps in part due to certain re-pricing scams pulled over the years by Mrs Stevie wherein she arranged for "forgotten" price tags showing $15 to be discovered on souvenir shirts that, in fact, cost $25 and more apiece which were gifted to him on our return. We drove there in about two hours or so - it's a straight line north from Grande Prairie to Rycroft down a road with few turn-offs3 so Mrs Stevie told me to drive, secure in the knowledge that I couldn't possibly get lost. I have to say that being behind the wheel of the Ford Leviathan Supa-Kab Turbo-X was just as terrifying as I had thought it would be. A touch of the foot on the gas pedal would cause three foot-long flames to belch out of the exhaust and the windshields of vehicles behind us to shatter while we were subjected to four gees of acceleration, the truck slewing down the road barely under the control of the screaming driver. "Will you be more careful!" snarled Mrs Stevie. "I can't help it. I've never driven a vehicle designed to kill James Bond and win the Indy 500 before!" I snarled back. Eventually we arrived and Mrs Stevie demanded tea and snacks in the diner. Snacks turned into lunch, after which we did some photography. I used my digital SLR to capture the environs of the mighty grain elevators in their slow, sad slide into silent senescence. Mrs Stevie and the Stevieling used their iPads to do whatever people lucky enough to have iPads bought for them by generous relatives do. Make HD movies and post them on Yootoob and Facebok I suppose. I dunno, because I don't have an iPad, I just get to buy them for everyone else. But am I downhearted by this despicable disparity in digital deployment? After the capturing of images Mrs Stevie demanded tea so it was back to the diner for more tea, at which time we got a phone call from the StevieSis. Mrs Stevie took the call, and apparently had some difficulty getting the StevieSis to believe we would have the gumption to drive to Rycroft - or perhaps have a reason to do so. It is, when all is said and done, a crossroads with nothing much to offer a tourist per se, serving a rural farming community and a transient trucking industry. Once Mrs Stevie had persuaded the StevieSis that yes, we were already in Rycroft and about to depart, the StevieSis said we should use the opportunity to go on to Dunvegan and visit the gardens there. So we did. The best part for me of that part of the trip is the long descent into the river valley and the giant yellow suspension bridge4 the Albertans threw across the river. It is a magnificent view and the bridge is a magnificent structure. The road then climbs up the other side of the steep valley walls, but there is a turn-off into the historical Dunvegan preservation site and camping area. As an aside I'd also like to point out that the Albertans built these very steep roads with a bit of common sense about the sort of traffic they would be carrying, making provision for nimble cars to pass enormous trucks struggling with heavy loads up steep hills wherever possible. Dunvegan was originally a trading post and a church. Much of Canada has the same sort of history, with rival trading operations being set up and then moved about to take advantage of new and sometimes ephemeral markets. At Dunvegan a number of original structures have been preserved and others relocated to the site (in much the same manner as was done with Spon Street in Coventry in the UK) and for a small donation one can tour the village and walk around inside houses from the last century. The area is beautiful with the steep valley walls climbing into the sky and the river flowing swiftly past, but it must have been hell during mosquito season I'd think before the invention of Deet and the crop-sprayer. This day the weather was perfect and I waved away the womenfolk and dozed quietly in a seat overlooking the river until they decided that I'd had enough respite for one day and poked me awake so I could take pictures of them wearing Batman T-Shirts. Mrs Stevie wanted to gift the StevieNephew and His Bride with pictures of the entire family in candid shots of them each wearing these shirts because the wedding was supposedly “Batman Themed”. We had no real idea what this meant, and all our asking had elicited no real answers from the family because it turned out none of them had any idea of what it all meant either. It was something the bride and groom had stated but had never explained to anyone's satisfaction. I had originally planned to have my hair dyed green and to turn up in whiteface a-la Caesar Romero, but in the absence of any reassurance that this would not be "overdoing it" had abandoned the idea as a good way to get punched up the throat by the StevieSis while Mrs Stevie held me down. Oh right. Anyway, we started back because we had a deadline to meet. The StevieSis was throwing a party. We had a little time to spare so Mrs Stevie instructed me to pull off about halfway home in Sexsmith so we could find and explore the Historical Main Street en passant. 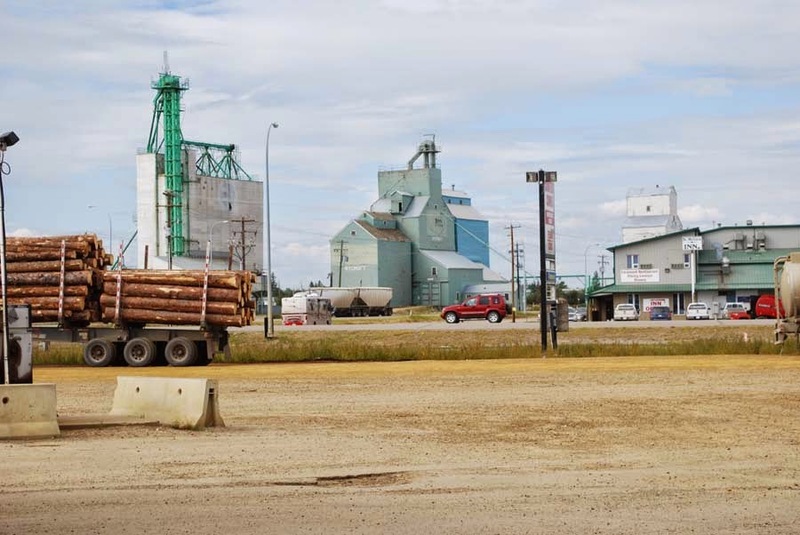 I drove us into downtown Sexsmith and found a street lined with the sorts of structures one normally expects to find in a Hollywood western, with large flat fronts that offer a space to write large the business and what it does and front doors centrally placed between two windows. There was a general store, a small restaurant, a post office, an ice-cream parlor and a bunch of other businesses. Mrs Stevie went to investigate while I snoozed in the cab of the Ford Leviathan Supa-Kab Turbo-X, which I parked next to the working railroad spur and sawmill so as to disguise the sound of the mighty engine when it was restarted and give us time to escape any impromptu lynching parties incensed by the racket of the thing. I had begun to notice people had a tendency to throw clods of earth, horseshoes and small housebricks at us if we idled the vehicle within 50 feet of them. Mrs Stevie took about four thousand pictures with my camera, returning after about half an hour to say that we were out of time and that this was not Historic Downtown Sexsmith because she had noticed a sign on a different turn-off on the way in and I must've driven down the wrong way and messed it all up again. I looked around the small town and expressed confidence in my navigation and our current position with respect to Historic Downtown Sexsmith, but was cruelly disabused by Mrs Stevie who used Harsh Words on me for most of the remaining drive back to the hotel. That evening we embarked for Ents in the StevieSis's back garden, which had been converted into a luau probably by the never-enough-harassed Mr StevieSis (The StevieSis and Mrs Stevie having similar views on many things including how long it takes to achieve complex construction jobs they've never actually tried to do themselves, and the obvious candidates to be doing the work in question since they couldn't possibly have anything else to do). It was quite a sight, with a bar overflowing with bottles of beverages that could also be pressed into service as accelerants and, in some cases, varnish remover. Canadians in general have an eclectic palette when it comes to alcohol, and a never-say-die attitude that is well served by some of the concoctions that I've been offered that have prevented speech and even respiration for up to three minutes after taking a manly swig. There was also a barbecue surrounded by chunks of every kind of dead animal that had walked the prairie. Since I am firmly against the consumption of foods that did not once have a face, this met with my approval, though I could not express it for about three minutes owing to my having accepted a drink and taken a stiff belt of it before I'd thought to ascertain what was, in fact, smoking and etching the glass it was served in. Fortunately no children were as yet present, so no-one was emotionally scarred by the sight of my bulging eyeballs or the class three Words of Power I used upon regaining control of my breath reflex. The StevieSis was at the controls of some sort of demented cross between a food mixer, a gravel crusher and a barrel organ, and was turning out frozen drinks composed of one part vodka, one part stove fuel and five parts peach schnapps which she then pressed upon anyone daft enough to wander into theater. Mrs Stevie drank one and spent the next hour and a half giggling and falling about the place, which at least brought a halt to the torrent of abuse regarding Historic Downtown Sexsmith. In no time at all a cadre of Canadians of all ages had filled the place. The StevieSis is very popular and knows all sorts of interesting people, some of whom have had extremely lively lives, had adventures straight out of the most unlikely survival-against-the-odds movies and risen high in the ranks of society, which was why she asked me to sit at the back and not draw attention to myself if possible, at least until the important guests had gone home. We had a ball, telling tales and drinking aviation spirit and eating anything that had been too slow to escape Mr StevieSis. Once all the youngsters had left Mr StevieSis fired up the firecone, a feature of many Albertan back yards it seems, and we sat by it until we were completely smoke-cured, talking away the night while the women cleared up. This we, by which I mean Mr StevieSis and I, had arranged by the simple plan of breaking a few things while trying to "help". It never fails, and though neither the StevieSis nor Mrs Stevie were fooled for an instant that we were non-compost mentis due to a surfeit of Organ Grinders5, neither were they willing to try and wait out our "clumsiness". We left around 11:30pm, when it was just getting dark. There was a nasty moment when Mrs Stevie fired up the motor of the Ford Leviathan Supa-Kab Turbo-X and it inhaled one of the StevieSis's hanging baskets o' flowers from the porch, munched it in the engine, then spat flaming shrapnel out of the exhaust and into the neighbor's yard where it severely scorched some rose bushes, but they just laughed it off as one of Those Things so we pretended we hadn't noticed and drove off into the twilight. As I said to Mrs Stevie, it takes more than a few ruined roses to discommode an Albertan.